Vegan olive tapenade is a great spread to serve with crackers for an easy gourmet appetizer or hors d'oeurves for any party where you're expecting vegetarian or vegan guests (or just guests who like good food!). This simple and easy homemade olive tapenade recipe uses two kinds of olives to give a pleasing color combination to the dish. 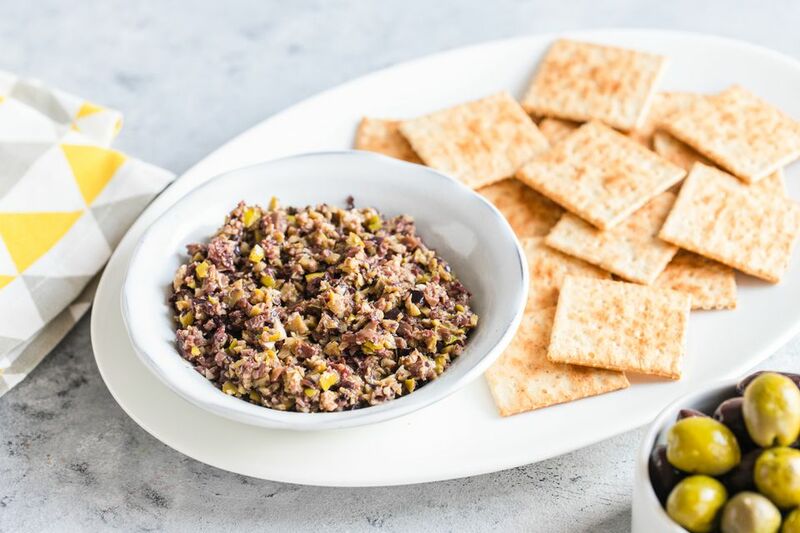 Olive tapenade can be served in a small dish alongside your favorite crackers, flatbread or toasted slices of baguette, or use it to top off some homemade hummus for a layered dip with a beautiful presentation. It's the perfect starter for a summer lunch or dinner on the patio or poolside. You can also enjoy it with a glass of chilled white wine. Some more ideas for using up homemade tapenade? Putting olive tapenade on bread adds a lovely zing to vegetarian sandwiches, or you can also toss it with pasta for hot or chilled noodle dishes. This recipe is both vegetarian and vegan and can be prepared in just a few minutes using a food processor or a knife to mince the ingredients finely. If you've got a food processor, you can process all the ingredients for a few seconds. Don't process too finely, since tapenade should not be completely smooth, but more of a thick and chunky paste. Of course, you can also process it to whatever texture you prefer! Serve the tapenade with crackers, flatbread, baguette, or slices of toasted artisan bread. Place it in a small bowl with a butter knife for guests to top the bread or crackers. If you don't have a food processor, finely mince the olives and garlic, then combine with all the other ingredients, mixing well. Also, consider using it to top hummus and add a layer of flavor, or mix it in with hummus for a dip. Olive tapenade doesn't have to be refrigerated before serving, but you should refrigerate any leftovers. You can use it for a few days after preparation if you keep it cold.